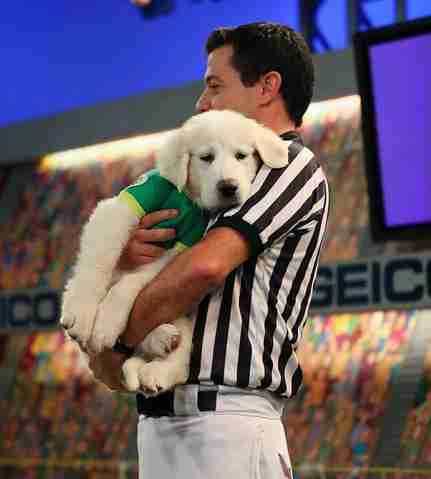 Puppy Bowl, the annual dog party that rivals the Super Bowl in both popularity and attractiveness of players, has come upon us once again. 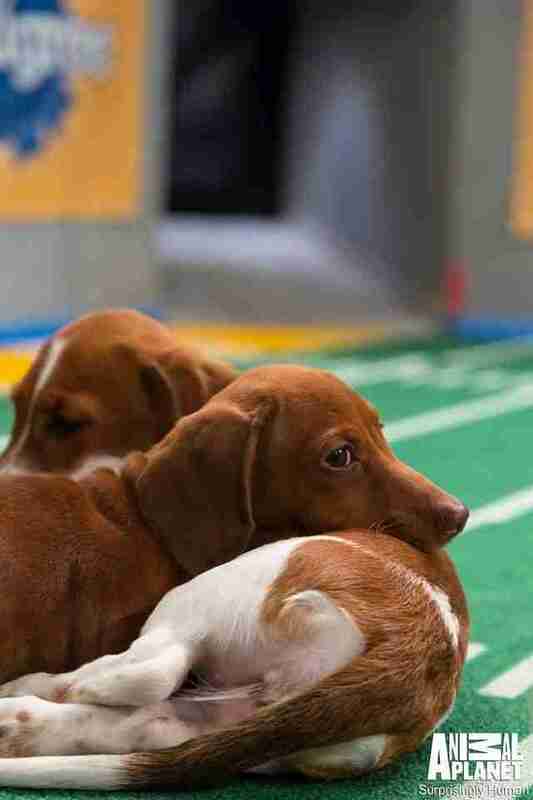 And this year, the play is fierce, the stakes are huge and the athletes are hungry for treats. Puppies as far as the eye can see! 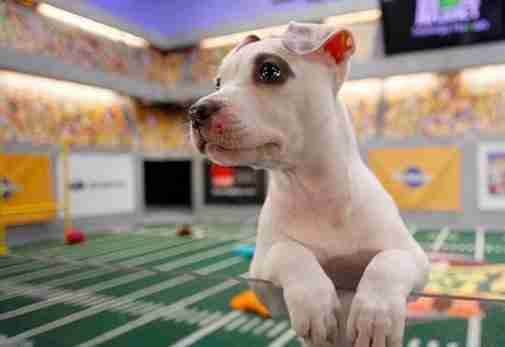 Going behind the scenes at Puppy Bowl XI, which takes place inside the closed doors of an undisclosed location in midtown Manhattan, is like entering a bank that carefully guards hordes of cuteness instead of gold bullions. Entering the holding room, a white-washed square where the contestants await their time on the turf, I was met with a child's (or anyone's) dream: a room filled with puppies. Big puppies, small puppies, sleeping puppies, drooling puppies, one-eyed puppies - they were all there. Their owners were there too, touting the puppies' charms with distinctly toddler-beauty-pageant-mom pride to anyone who would listen. Many of the puppies are the pets of people who simply wanted to show off their dogs - and think that their pets have what it takes to compete at the big leagues. Others are brought by rescues in the hopes that the stardom will attract a home for the pups. Most of them have already been adopted! There are 55 puppies competing. They're divided into small, medium and large groups, and then green (Team Ruff) and yellow (Team Fluff) teams. Each will go head-to-head for about a half hour, while a real-life referee (not actually a real referee, though he does have a real whistle) monitors the field. 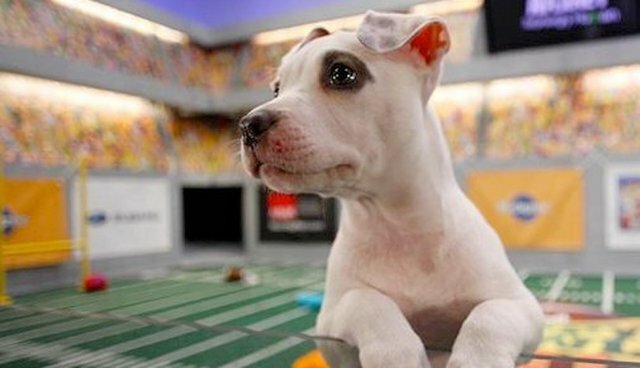 Groups make their way onto the field while a crowd of proud pet parents, camera people and reporters watch, joining together in one of our nation's most beloved pastimes: puppy-watching. There are certain qualities that make a puppy a likely candidate for lots of on-field time, or for the coveted award of MVP (Most Valuable Puppy). See the starting lineup here - the best of the best. 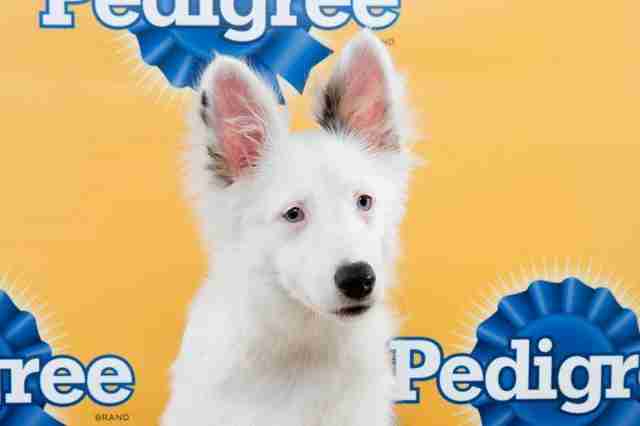 We're rooting for QB Chicklet, a 15-week-old Sheltie. Chicklet's owner told The Dodo that she's partially blind, but no less of an athletic threat. The sports event of the year airs on Animal Planet on Sunday starting at 3 p.m. for 12 hours straight. Winners will be chosen based on viewer's votes - start drafting your fantasy team now.